Hummer's Russia sales rose 111.5% in May. Volume is up 86.6% after 5 months. EDITOR'S NOTE: Citroen’s Russia sales volume in May rose 43.6 percent to 1,317 units. A story and headline in the June 22 Automotive News Europe weekly newsletter inadvertently excluded Citroen from the list of winners in Russia in May. Hummer and Citroen were the only automakers to report a month-on-month sales increases in Russia in May, according to figures from the Association of European Businesses in the Russian Federation. The General Motors SUV unit’s sales rose 111.5 percent to 129 Hummers while Citroen's volume rose 43.6 percent to 1,317 units in May. Every other brand on the AEB’s list had a double-digit decline last month. 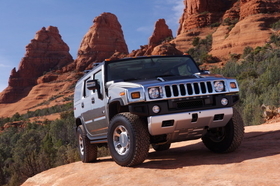 Through five months, Hummer’s sales were up 86.6 percent to 614 units. The numbers are tiny, but they provide a bit of good news for a brand that has suffered a massive decline it its top market: U.S. sales were down 63.7 percent to 5,113 after five months. GM hopes to be free itself of Hummer soon. It has tentative agreement to sell the SUV brand to China’s Sichuan Tengzhong Heavy Industrial Machinery Co. Overall, May sales in Russia declined 58.0 percent to 119,376. Through five months, sales in the country were down 47.0 percent to 645,162.